Design for kids in days of routines allows to make each day different and more special for children, where kids are also able to develop new skills and learn new things while playing and interacting with everyday products. Nowadays, children after school have a lot of homework of different subjects, extra activities and responsibilities at home. Therefore, it is still important to find a moment where allow children to play. Play is learning, while playing kids have their young minds open to learn in new and fun ways; even if children don’t know that they are doing it. In other words, play makes learning something that happens naturally and joyfully, when a child laughs and wonders, explores and imagines. Furthermore, in play, children develop a lasting disposition to learn. Play Chair is a chair designed by studio deFORM that combines free play with a practical wood chair. The main features of it are sitting, playing, storing and sharing. It is made of durable bended plywood and it is composed by fifteen foam building bricks covered in colorful fabric which can be taken off and washed. Play Chair has a light structure that allows an easy carry around and manipulation. 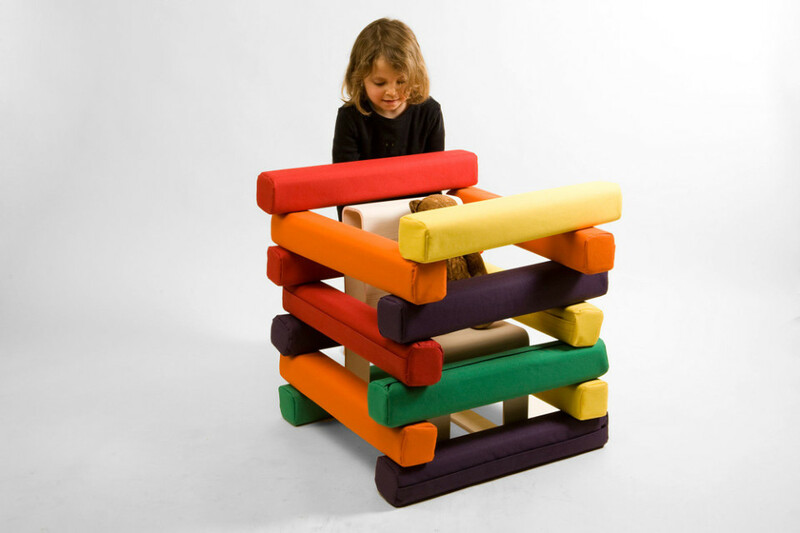 rather than small copies of adult furniture. During free time children can play with the foam bricks and stimulate their creativity building a fort, a house, a secret refuge, a tunnel or whatever their imagination suggests them. Kids can enter inside the building structure and play with it, living their own stories and sharing it with their families and friends. Then, when it is time to clean up, the building bricks are fitted back into the wooden fame of the chair, so it doesn’t occupy much space and also this also provides an additional seat which can be used by children’s teddybears or other friends. Therefore, design for kids thinking how to improve these days of routines helping children to easily find a way to be creative and play during their spare time, can help them to develop different skills, for example creating new spaces or new stories from just a wood chair. Kid’s imagination is endless, let’s help them to use it and enjoy every opportunity to play, create and learn in their free time.